Identification: Forewing is pale gray with a yellowish tint, wavy black lines and dashes, and inconspicuous white spots. 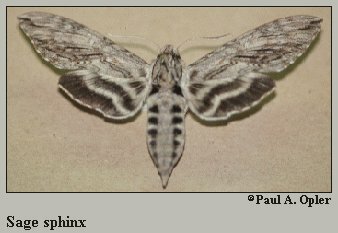 Hindwing is pale gray with a white band between 2 black bands, and a diffuse black patch at the base. Wing Span: 3 - 3 9/16 inches (7.6 - 9 cm). Life History: Fully-grown caterpillars pupate in chambers in the soil. Flight: . Two broods, from April-May and from August-September. Caterpillar Hosts: Sage (Salvia species). Habitat: Great Plains, probably sandy prairies. Range: Kansas south to Texas, west to Colorado and New Mexico. Conservation: Population status and ecological requirements should be investigated.